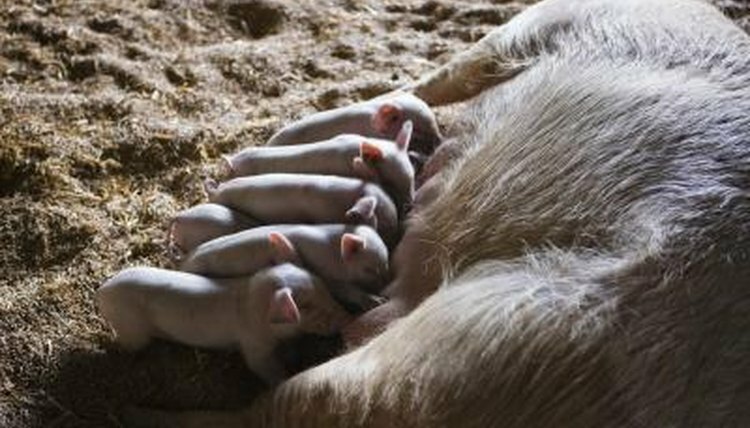 Potbellied pigs aren't always perfect mothers -- in fact, during the birthing process, a needy piglet can make mama's mood pretty sour. If you're dealing with a porcine pregnancy or birth, then, you need to know what to expect long before piglets start popping out. That way, you can help the mama deal with her circumstances and make sure that the babies all get off on the right hoof. A potbellied pig can live up to 30 years, but she won't waste any of that time -- she'll be sexually mature when she's as young as five months old. Once your pig is sexually mature, her cycle will make her sexually receptive on a regular basis. Expect her to want a mate once every three weeks or so, and for 2-3 days at a time -- this is when she is in estrus. During that period, she may seem restless and chew on things that she would normally leave alone. A potbellied pig remains pregnant for about 114 days, or three months, three weeks and three days. When pregnant, she won't return to estrus -- this is how you can guess that she's carrying piglets. Only at about the three month mark will she be noticeably pregnant -- you'll notice her abdomen balloon in size and her udder become more pronounced. A piglet's skeleton begins to form around day 30 of the pregnancy, demonstrating just how quickly the development takes place. When a pig gives birth, the process can get a little messy -- remember, she could give birth to sic or more piglets. She needs a safe, warm, dry and draft-free place where she can relax for the birthing process, and you'll need to be on hand for replacing the towels under her as they get saturated with birthing fluids. As each baby is pushed out, you may need to help clear the way for the next one. Fortunately for you, piglets are born very well-developed, and can open their eyes and walk within moments. Piglets can be needy, but mama wants to be left alone while she finishes giving birth to everyone. Piglets must be thoroughly dried off and kept warm, and they may need a little guidance finding one of the mother's teats. Suckling on a teat is acceptable as long as the mother allows it -- she just doesn't want any piglets near her face or the opening from whence they came.